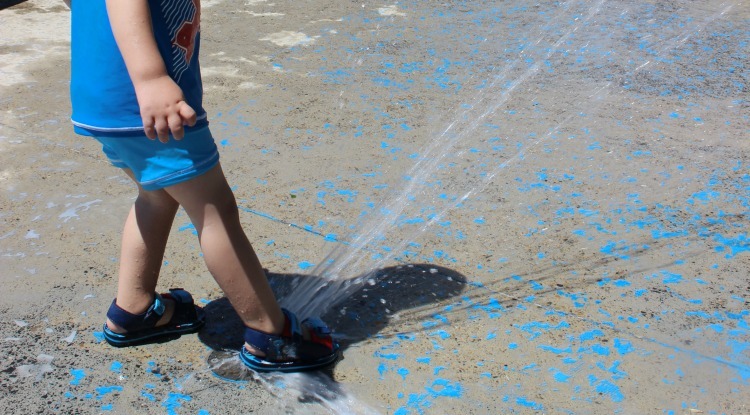 Running under the sprinkler used to be such a quintessential part of every Aussie’s childhood. I’m sure we all remember it! A lot of us would also recall happy times spent having water fights (with or without water balloons!) and the iconic ‘slip n slide’. These days however, fewer and fewer of us in the major cities have a large enough slice of the Australian dream (of a backyard) to accommodate this kind of outdoor play. 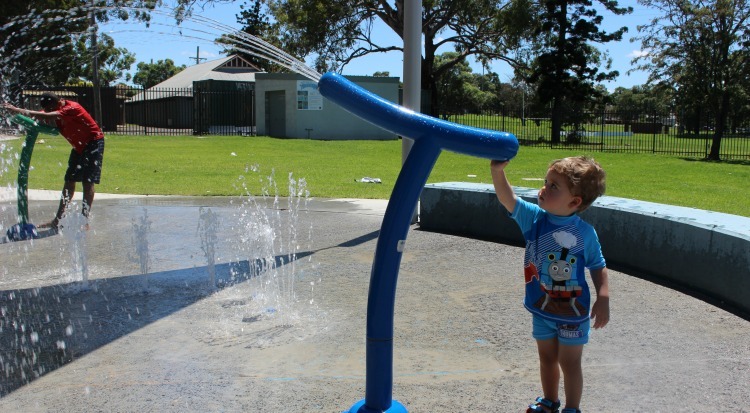 Also, Australians have faced water restrictions and have become a lot more conscious and sensible about our water usage which has changed the way we view this kind of play- making it less innocent and more of a guilty pleasure. It makes sense therefore that we should move towards a different model, one that is more communal and more environmentally friendly so that we can beat the heat without feeling any remorse. 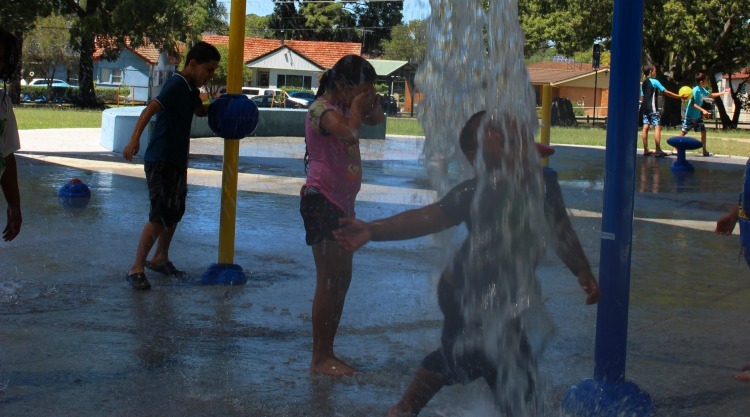 Thankfully, councils across Sydney have really stepped up in the last few years, building specially designed water parks within existing green spaces that turn off when not in use and which recycle water. 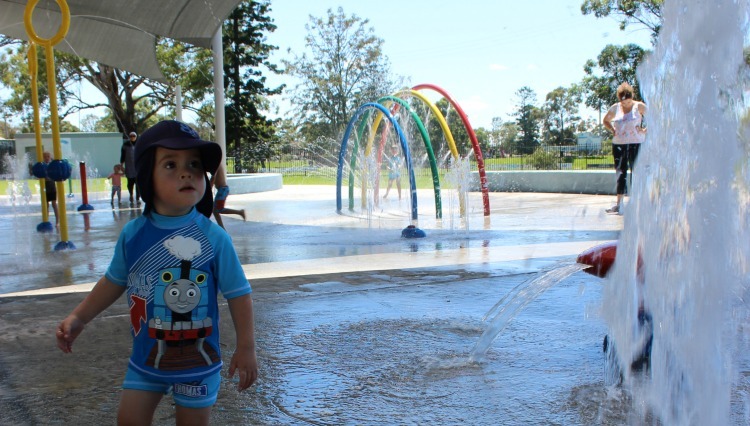 Granville water park, which opened a couple of years ago, is our local and incorporates these environmental innovations. Situated within easy walking distance of Merrylands station, you will often find us there particularly of a hot summer’s evening. There is also ample parking for visitors situated adjacent to the park on Montrose Avenue and Claremont Street. It’s the perfect way to burn off pre-bedtime restless energy and to rid ourselves of the heat of the day. Granville Park is generally used for sporting events and large personal training sessions and despite its small (unfenced) playground and skate park (both right next to busy roads), its not really a place you’d bring your children on a regular basis unless it was within walking distance. But come summer, the place comes alive with the laughter of children when the water park resumes service. Cannons And Buckets And Fountains! 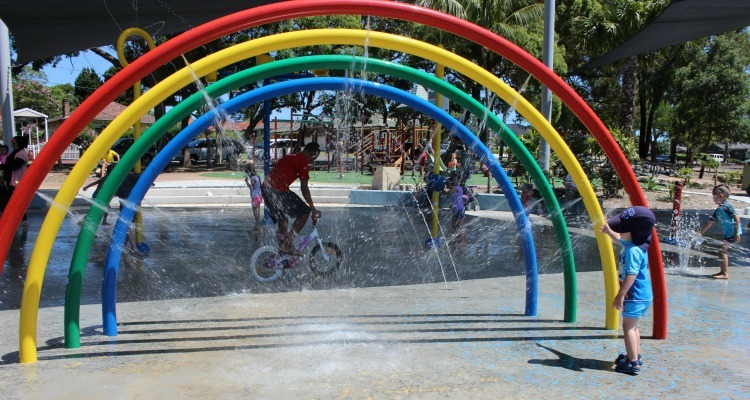 There are three distinct areas within the water park- one with water cannons for safe water fights, one for the bigger kids complete with large buckets that fill and empty at random onto those standing beneath and also a ‘junior’ area with mini fountains at toddler height. This allows children to explore at their own pace. I have a very adventurous 18 month old who will venture into all of these zones without fear and who ends up drenched from head to toe and a much more cautious 4 1/2 year old who will walk around the periphery of the park, occasionally dipping a toe in here or there (and who we occasionally take home with no signs of him having been at the water park with us upon him!). But they both still have a lovely time despite their very different approaches. While on the whole this is a terrific and enjoyable place for children, I do hold some reservations. Firstly, during school holidays and after school is out for the day it can become extremely busy with older children who can on occasion become quite boisterous and who often come to the park with limited or no supervision and engage in potentially dangerous activities such as riding bicycles through the watery areas and playing rough games of tag. Given that these water parks are built on concrete foundations, this can and does result in some pretty nasty falls. If you have older children yourself, they are no doubt equipped to better avoid accidents in this context but if you have toddlers and preschoolers, I would recommend keeping your visit to within school hours when it is quieter and when it is occupied by children of a similar age. The water park is protected by shade cloth so while I would still recommend taking the time to slip, slop, slap, there is little likelihood of getting burnt thankfully. Secondly, as mentioned above, the children’s play area in this park, located just next to the water park, is right next to the often busy Montrose Avenue. If you have a bolter of a toddler (which I do) this means that you must remain absolutely vigilant at all times to avoid them running in that direction. It could happen in a matter of seconds. 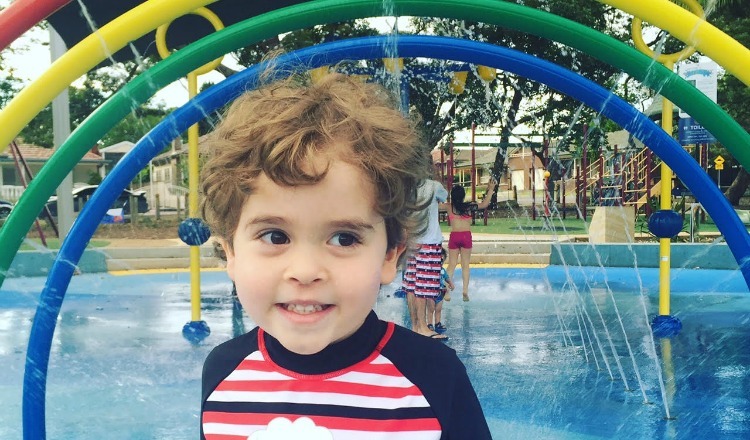 All of this aside, Granville water park is a fun, accessible space to explore and enjoy. There is no cafe within the park grounds but there are basic toilets not too far from the water park. Many families bring picnics and if you were wanting to stay for a while, this would be a perfect option.